Purina Pro Plan OptiDerma Sensitive Skin Medium Adult Dog Food is a specially formulated, complete dog for medium sized dogs with sensitive skin. Built around a specific combination of skin-targeting nutrients that are proven to support your dog’s skin and their naturally healthy coat, Pro Plan OptiDerma also contains sources of protein, which can help reduce possible skin discomfort associated with food sensitivity. 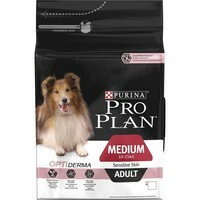 I have been using Purina Pro Plan for just under 20 years . It has provided good quality nutrition that my dogs love . It’s given me 3 international champions , it’s a food I highly recommend .